Hello! Welcome to a continuation of my previous post of Day One at Pensacola Beach, Florida. 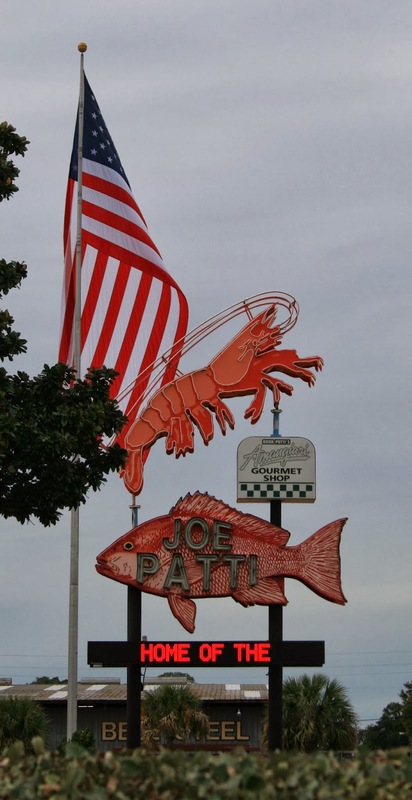 On our first day of vacation we spent the morning at Big Lagoon State Park, then we got hungry so we paid a visit to the world famous Joe Patti Fish Market. I had never been to a fresh fish market before, so this quite an experience for me. The first thing I noticed was how CRAZY BUSY this place was for a small town. The parking lot was filled with cars and people were walking in by the masses carrying coolers. Upon stepping in the door the first thing you notice is the smell of fish and then you see a long counter filled with every kind of fresh fish, shrimp, lobster and crab you can imagine. It seemed so crazy busy and we felt totally loss at what to do, so we just walked around a bit trying not to bump into anyone. Eventually we began to see that there was an organized system in place for most of the people seemed to be regulars and knew exactly what to do. The first thing was to grab a number and a basket and wait for your number to be called. Then you pick which items you want. If you want the item steamed, which is free of charge, you go into a second line which is also where you pay for the item. The store not only sells fresh fish, but there is also a sushi bar, a dessert bar (where they had delicious cheesecakes and gelato), a soup bar, wines, and a gourmet delicatessen. Since we had just spent the morning hiking, we were famished. So we all got big bowls of the most delicious clam chowder I ever had and ate them on a small outdoor patio out back. The portion was very generous, and included tons of fresh bread or crackers for only $3.25! It was the best clam chowder I ever had. After we finished eating, we then went back in and purchased three pounds of shrimp and a bottle of cocktail sauce. It was about $27.00 for the shrimp, and we had it steamed, then we took that back out to the patio and ate probably a pound of that and saved the rest for later. And if that wasn't enough, we then went back in and bought dessert. I tried gelato for the first time because my daughter (who is from Chicago) said it was extremely cheap compared to what she is use to seeing. I've always wanted to try gelato, so I got some, but I honestly couldn't see what all the fuss was about. I prefer just plain ice cream, especially hand made ice cream! 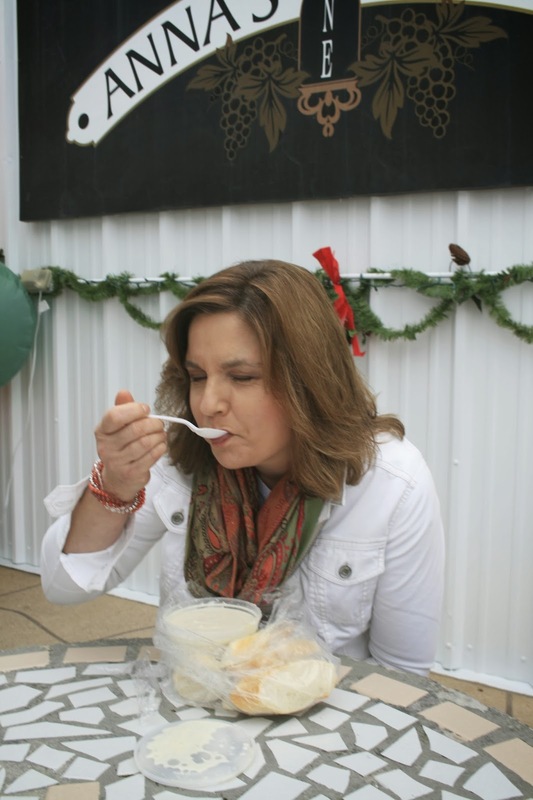 Here I am eating my clam chowder. Yum! It was delicious. I wish I could have brought some home with me. It felt especially wonderful having hot soup on a chilly day too! Here is our shrimp feast, doesn't it look sumptuous? After all our tummies were full, we then headed to the National Naval Aviation Museum which is located on the military base in Pensacola, Florida. Admission to the museum is free, but anyone over eighteen has to present a valid I.D. to get on the base. The first picture shows a plane outside the museum. Now, I really have no interest in airplanes, but we decided to go to this museum because it was free, and also because we had never been to an aviation museum before and thought it would be a once in a lifetime experience. When I first walked in the door, I was awestruck. I couldn't believe how HUGE this place was, and what an amazing and well done museum it was. The museum has several large open wings, where it seemed every large aircraft ever used is on display. My favorite one was the one pictured below. I've seen this plane in old movies before, but to see it in person and see the sheer size of the plane was phenomenal. Next to this plane was an area where you could read all about the plane and watch a video about why the plane was created and what purpose it served. Although there are plenty of employees walking around and watching you, you can get right up to any plane and touch it. There are no bars or barriers. I loved that! The employees were friendly and answered any question you had. There are free tours available too. They had several Blue Angel planes hanging from the ceiling, and there was even one on display that you could sit inside. In the balcony are also several cockpits that visitors can also climb into. It was amazing to us how small these cockpits were. They must have been uncomfortable for long plane rides! All around each wing is a wrap around balcony which feature smaller displays, video's, and lots of interactive simulators which you have to pay for to participate. I actually liked the balconies because it gave you a second view of everything you just saw when you walked the main floor. The next three pictures were taken from the balcony. The balcony is more museum-like where you see displays like the one below. These displays are roped off because they are scenes of how planes were used in their time period. This one is showing a World War Two plane. I also saw a display of how soldiers lived and slept, and there was also an area showing vintage displays of how American citizens lived and helped in the war effort. That was my favorite area, being the homemaker that I am. This area showed what the typical American living room and kitchen looked like during WWII. There was also a video showing the things Americans did to aid in the war effort like living without certain foods and goods, how they cooked, giving up their pantyhose, and collecting items for recycling to make ammunition. It was quite fascinating. The museum also houses a very large IMAX theater and restaurant, but we didn't see any movies because it cost $8.25 per person, and we've been to IMAX theaters before. 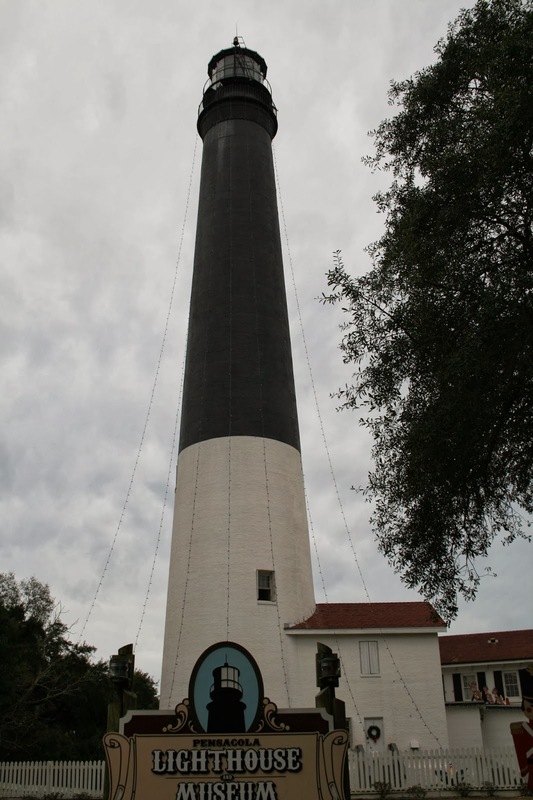 After we left the museum, we then went to see the historic lighthouse which is also located on the base. 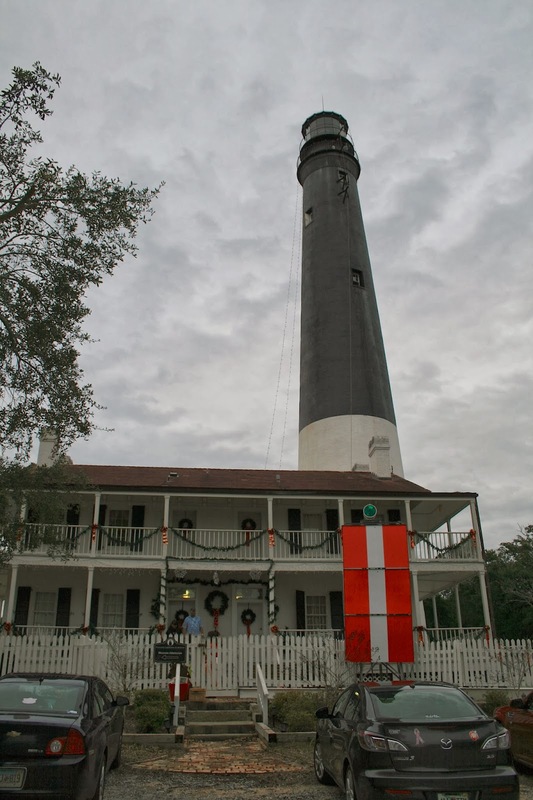 Visitors are free to walk around the outside of the lighthouse, but it costs $6.00 to go inside and walk up to the top and visit the museum. We didn't want to pay the $6.00 and we also were too tired after a day of walking already, so we passed on that. After our day at Big Lagoon State Park and the Naval Aviation Museum, we then headed back to the hotel to spend more time at the beach before the sun set. It was a cloudy day, so there was no beautiful sunset our second night, but we still enjoyed listening to the waves, collecting shells, and watching the birds. Afterwards, we went into the hotel lobby to play a family game, eat some popcorn, and simply relax. Sounds like another fun day! Fabulous photos! I know my husband would have a blast at the Naval Aviation Museum! Oh great ! SUperb shots my friend !